Read the will. The personal representative has the responsibility to notify all heirs of the estate that they are heirs and that the estate has entered probate. 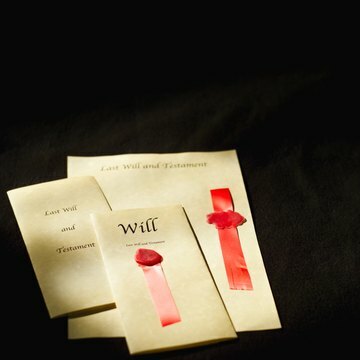 After the will is filed with the probate court, it is accessible for you to read or copy. Identify exactly what property you are to inherit so you can prepare. Real property, for example, must be re-deeded in your name after probate closes before ownership transfers to you, but if it financed it also has to be paid off. Knowing ahead of time that you have to arrange a refinance is a helpful. Put your name on file with the probate court if you feel you are an heir but were not mentioned in the will or notified of the probate proceeding. Alaska, Maine, Arizona and New Mexico, for example, have statutes that allow filing a Demand for Notice if you know you are an heir of a deceased but were not included in the will. This can happen if you born late in life to the deceased, after the will was finalized or if the deceased promised you property but didn't note it in her will. Include in the Demand for Notice all the information required by the demand statute for the state where the probate is filed. Usually this includes your identifying information, your relationship with the deceased and a description of the property you think you should inherit. After filing the Demand, the court copies you on all notices concerning the probate proceeding just as any other heir of record. Request an early partial distribution, before the estate is settled, if you want the property right away that was left to you in the will. This is not possible in all states or in all situations, but the personal representative can tell you if it is possible in your case. Generally estates take about one year to complete probate, longer if the estate must file a federal tax return and wait for the Internal Revenue Service to return a letter approving the close of the estate. In Ohio, for example, the personal representative can give the deceased's spouse and children $25,000 as a year's living expense. Small monetary amounts or pieces of minor personal property can be disbursed early with good reason and judicial approval. You may want to contest a will for many reasons. You might believe that the decedent left a more recent one and you need time to investigate. Perhaps you have reason to believe that the decedent wasn’t of sound mind at the time she made the will. The law in New Jersey is set up to provide you with a window of opportunity to prevent a will from being probated until you have an opportunity to convince a judge that it should not be.